The Dutch know how to do excitement. From the techno scene in Rotterdam to the areas of Amsterdam that you make sure your parents don’t see, the whole country is geared towards having a good time. This is also true when it comes to the end of the season, with playoff games used to determine several important outcomes. Elsewhere, Groningen were taking on AZ Alkmaar for the final Europa League place, but my interest was at the other end of the table. 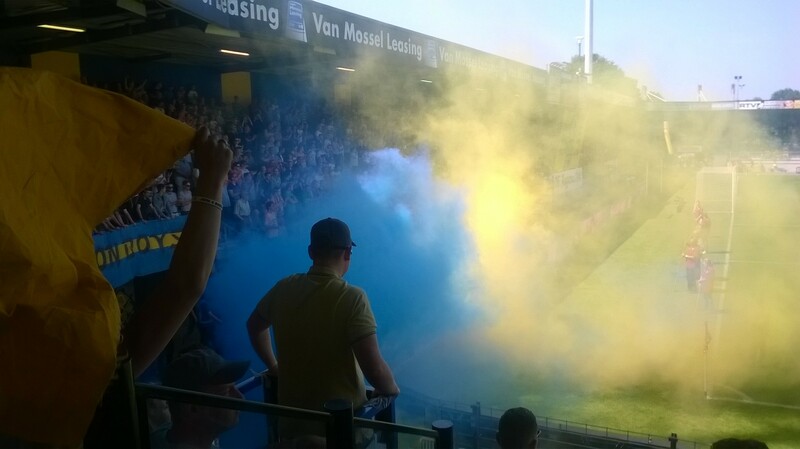 Top flight RKC Waalwijk were hosting second tier Excelsior in the relegation/promotion playoff final, with everything to play for in the second leg. 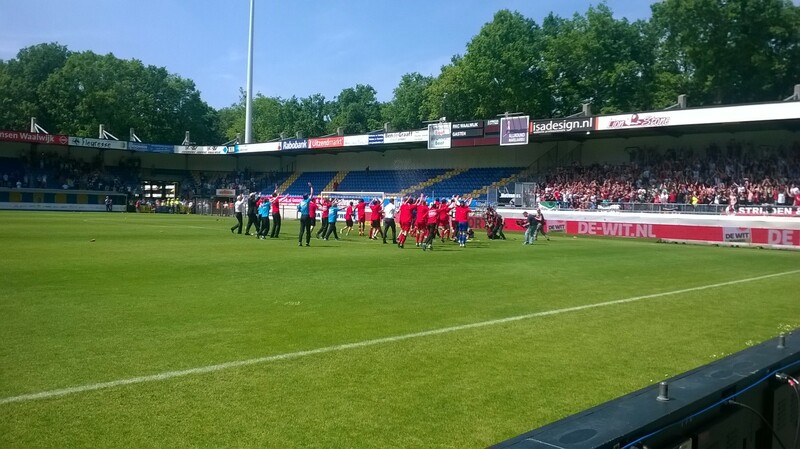 To put it simply, the winner would play in the Eredivisie next season, while the loser would play in the second. This meant I could either witness a simultaneous relegation and promotion, or nothing change at all. Even better, Excelsior have close links with Feyenoord including a number of loan players, meaning there was a good chance I would see several of their players running out in red and white at De Kuip in the future. Unfortunately I was unable to get a ticket in the away end, and indeed it looked at one stage that I might not be allowed in the ground at all. With my name being on the Feyenoord database, the staff at Waalwijk were hesitant to sell me a ticket. 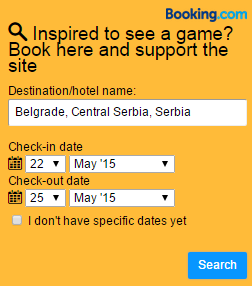 Luckily, there is no better way to get what you want than being a confused looking British person in another country. After asking the woman behind the desk “Spreekt u Engels?” for the second time, she gave in and let me into the ground for 12 Euros. RKC had lost the first leg 2 – 0, meaning they needed to make a fast start if they had any chance of staying in the division. Their failure to secure an away goal meant that if they conceded they would need to score four goals to win the tie, putting the visitors from Rotterdam in a very strong position before the game even began. They knew it as well, with the away end making a huge amount of noise as the 12:30 kick off time approached. 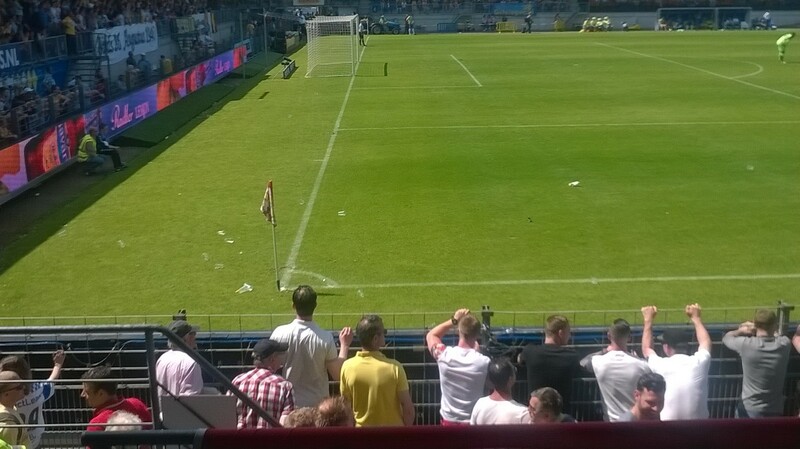 The home fans were also up for it, especially the Vak F group in one of the corners. They set off a number of blue and yellow smokebombs as the players entered the field, with a large number of streamers fired into the air. Everything seemed to be set for the home fans to roar their side to a famous comeback, but the visitors from Rotterdam very much failed to read the script. Just four minutes were on the clock when the ball was whipped into the area, with striker Lars Veldwijk in an embarrassing amount of space. He made no mistake with his powerful finish, opening the scoring in front of the travelling fans. Already possessing a strong lead, the Excelsior’s fans went absolutely loopy. It was one of the celebrations which only comes around once or twice a year, where an important and unexpected goal results in everyone blacking out for a short time through joy, ‘waking up’ a couple of minutes later ten rows away from where they started cuddling someone they’d never met before and would never see again. The players went equally mental, with everybody apart from the keeper running to the away end to celebrate with the fans. While Excelsior haven’t been gone from the Eredivisie for too many years, many of these players had never had a real chance to test themselves in the top flight. Now, they just needed to not concede four times in the remaining 86 minutes and they would have the chance to make this dream a reality. Despite it making their task twice as hard, the RKC fans were not too discouraged. After a few minutes of sulking, they got straight back to supporting their side. It wasn’t quite the same level as the Go Ahead Eagles who supported their side magnificently at Feyenoord a few weeks ago as they were hammered 5 – 0, but it was still impressive to see the ‘fanatics’ section of the ground back their team despite the almost hopeless situation they found themselves in. However, that was about to change. If it had been almost hopeless before, the Excelsior players decided to add the final nail in the coffin after just 22 minutes. Once again the yellow shirted defenders went missing, and their lower level opposition were more than willing to capitalise. 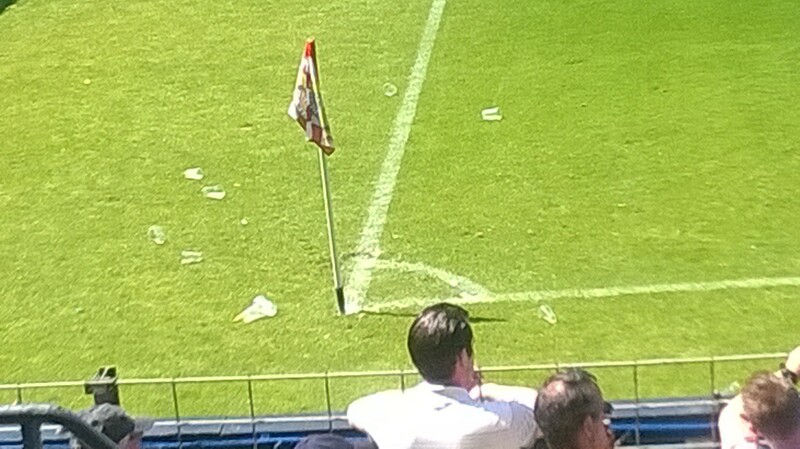 2 – 0, and once again the collective head of the away end fell off. I haven’t looked at an away end with such jealousy since watching the Chester fans at Wrexham, who were also celebrating a 2 – 0 lead. As was always going to be the case in this game with so much on the line, one side experiencing such joy meant that the other would suffer an equal amount of misery. 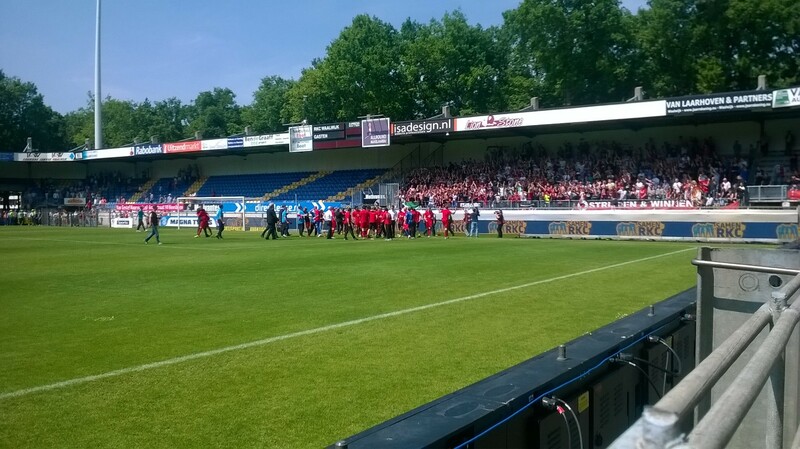 4 – 0 down on aggregate with 70 minutes remaining, several hundred RKC fans had seen enough and left the stadium. They needed five goals to save themselves, but it was still pretty embarrassing to see people leaving so early. The fans who stayed behind clearly agreed, throwing beer over those who were deserting the sinking ship, as well as chanting things at them that I could not possibly repeat. I did wonder if some of those leaving were just going to get a beer to numb the pain (or perhaps 10 beers), but the vast majority were indeed headed for the exits. If you go to a football match and you’re home before the second half kicks off, it’s safe to assume you probably shouldn’t go back. Just as those who left so early deserved, their team finally got a hold on the game. There’s no time to throw caution to the wind like when you need five goals, and clearly they agreed. The Excelsior keeper was forced into a number of good saves, while the home side also won a string of corners. None of the RKC fans truly looked as though they believed they could pull off the greatest escape since the Chilean miners, but false hope is better than no hope at all. With 38 minutes gone, one of these set pieces finally paid off. A corner couldn’t be cleared properly, and Beauguel scored for the home side. One down, four to go for RKC, and I began to think of the Cardiff vs. Peterborough game I had attended several years ago, which saw a 4 – 0 lead for Cardiff at half time turn into desperately clinging on to a draw as the Posh roared back and deserve to win. 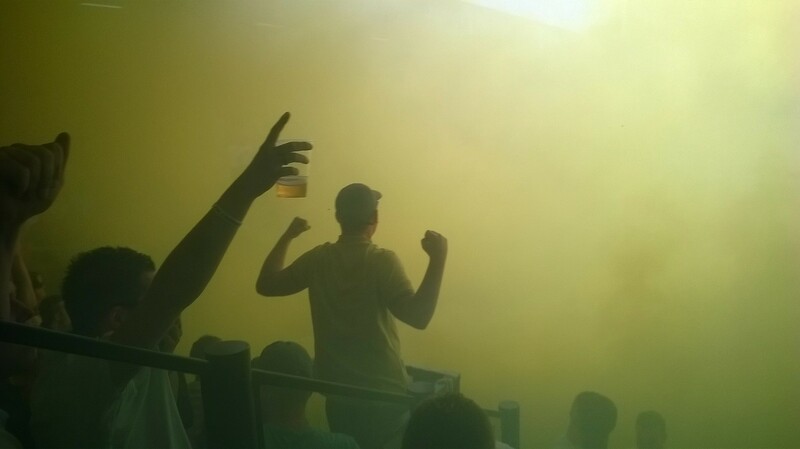 Then there was Borussia Dortmund’s comeback against Malaga from last year and the person I once saw in Manchester that had actually bought one of Rio Ferdinand’s terrible hats, was there going to be another addition to the list of football miracles I had witnessed live? I was going to have to hear a lot of goal music if that was indeed the case, as the person in charge of the tannoy decided to play a dance track to salute the goal, despite the fact they still needed so many more. I looked over at the away end during this, to see the Excelsior fans having a rave to the music playing to salute the goal they had just conceded. 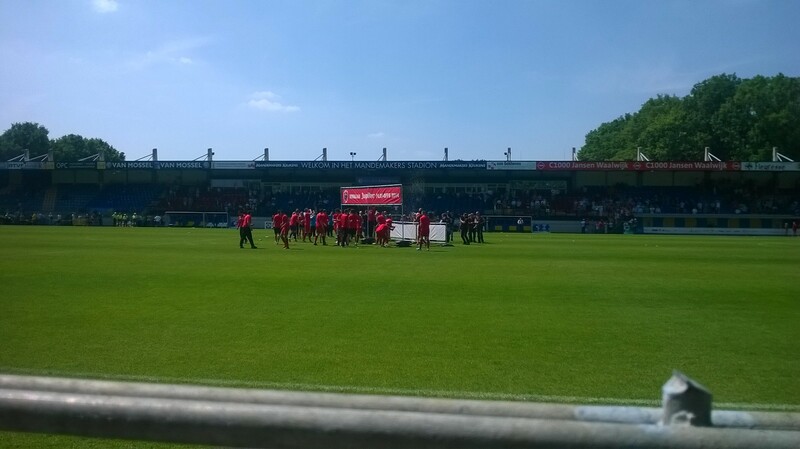 It was a boiling hot day, and most of the away end had their shirts waving in the air as they showed just how confident they were of hanging on to victory. Five minutes later, it looked as if the comeback could actually be happening. RKC were level, a terrific strike from Jungschlaeger hitting the back of the net and quietening the away fans slightly for the first time. They would still need three goals in the second half, but at least now they had the slightest of chances. The half time entertainment at football matches is usually pretty dreadful, but this was to be an exception. Some of the RKC fans who had left after 20 minutes had clearly heard the score, with around 30 of them trying to regain access to the stadium. This did not go unnoticed by the true supporters who had stayed for the duration, and a group of them went down to the entrance and told them they were not welcome back. I wouldn’t want to get anyone in trouble with the police, so let’s just say that some of these fair weather fans had some ‘strong encouragement’ to leave, and did not make it back in to the stadium. As it turned out, all they would miss in the second half was the chance to have a bit of a riot. The Excelsior manager had clearly warned his team that they were in danger of disaster, and they tightened things up considerably. There wasn’t too much time wasting, especially compared to how much you would witness in a similar situation in England, Spain or Italy, but they were a lot cleverer with their possession. The RKC fans could see these tactics were working and would be sending their team down within the next hour, unsurprisingly becoming infuriated. They chanted “sack the board” on a couple of occasions, and began to hurl things on to the pitch whenever an Excelsior player came close enough to the touchline. It was particularly bad during corners, as coins, lighters and pints of beer were directed at the Excelsior players. One of the midfielders got a bit too close to the sideline when looking to get the ball, and two RKC fans took the chance to climb the fence and pour beer over his head. He reacted calmly, tasting the beer running down his face and making the universal facial expression for ‘not bad’. Another Excelsior player was hit on the leg by a lighter with a couple of minutes to go, with the striker reacting by using it to light an imaginary cigar. It was bad to see from the home fans, but the Excelsior players reacted perfectly and allowed it to add to their celebrations. The party was really getting started in the away end, as more and more home supporters drifted away. 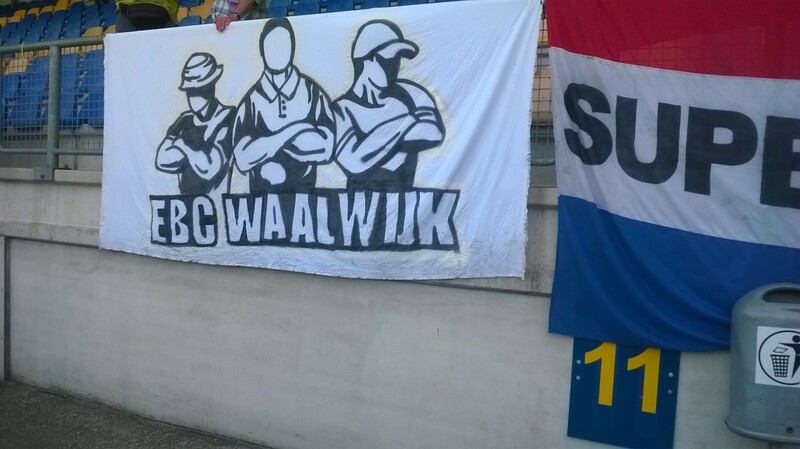 Eventually even sections of the ultras began to leave, although to their credit many more stayed and sang ‘Waalwijk til’ I die’. Amongst the other chants they sung were a number of anti-Feyenoord songs, one of them suggesting that Excelsior were only getting promoted because Feyenoord had paid for their team. I always try to be as neutral as I can in my reports, but have to admit I had to smile at the grown man in tears who was wearing a replica shirt and repeatedly wailing “This is all Feyenoord’s fault!” between the sobs. Bless. It looked as if RKC may at least have the consolation of winning the match, with the ball hitting the back of the net in stoppage time as they flung everyone forward. The brief celebrations were soon interrupted by the linesman, raising his flag for offside and putting the signature on Waalkwikj’s death certificate. As the referee prepared to blow his whistle I was able to move round to the away stand after telling a steward I was a BBC journalist (despite the fact I had no ID and was holding two beers) and joined the celebrations, which were as wild as you would expect from a group of people from Rotterdam with something to celebrate. As mentioned, that city knows how to party and was doing it in style here. There were measures in place to ensure that there could not be a pitch invasion, so the players conducted a stand invasion instead. They jumped into the crowd with the trophy, adding to the delirious scenes. People were celebrating all around the stadium, showing I wasn’t in being an undercover Excelsior supporter today, there were hundreds of them. They deserved promotion for their terrific support, and I look forward to welcoming them at De Kuip next season. 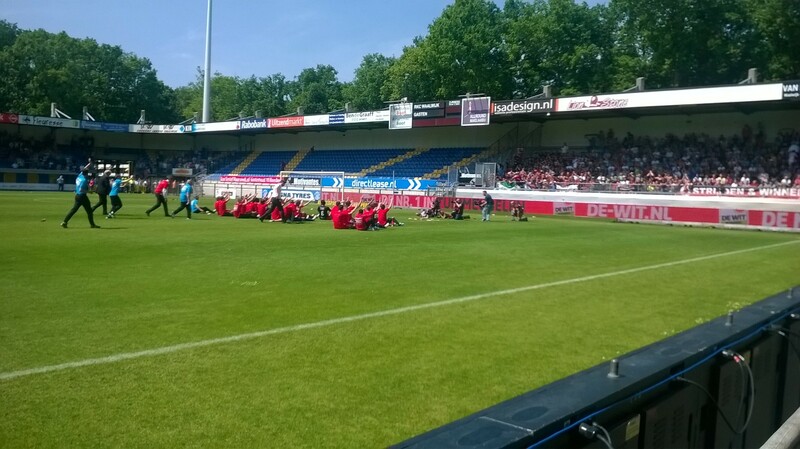 Meanwhile, RKC will be able to sing their anti-Feyenoord songs with Sparta Rotterdam fans, who were defeated 5 – 3 on aggregate in the other playoff taking place that day by FC Dordrecht, yet another club from the Rotterdam region. Posted on May 19, 2014, in General. Bookmark the permalink. Leave a comment.